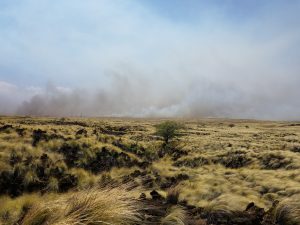 This past August, a wildfire burned a total of 18,000 acres in South Kohala and approached the Waikoloa Dry Forest Preserve on our mauka boundary. This is something that we have been preparing for and luckily, the fuelbreaks that we maintain as a buffer around the preserve kept the fire from reaching our restoration areas and native trees despite the high winds and limited access by fire-fighting personnel. Unfortunately, the fire did cross our buffers in the southeast corner of the preserve and 21.5 acres of predominantly invasive grasses were burned. This area, a remote pāhoehoe flow, was largely unmanaged before the fire due to difficulties accessing and planting and the lack of native plants in the vicinity. Much of what burned in the area was fountain grass, a fire-adapted, invasive species that has become dominant in Waikoloa over the past century. Fountain grass does not typically die in a fire and if left untreated, the grass would soon re-sprout and grow back vigorously, however, the seeds do not survive a fire. 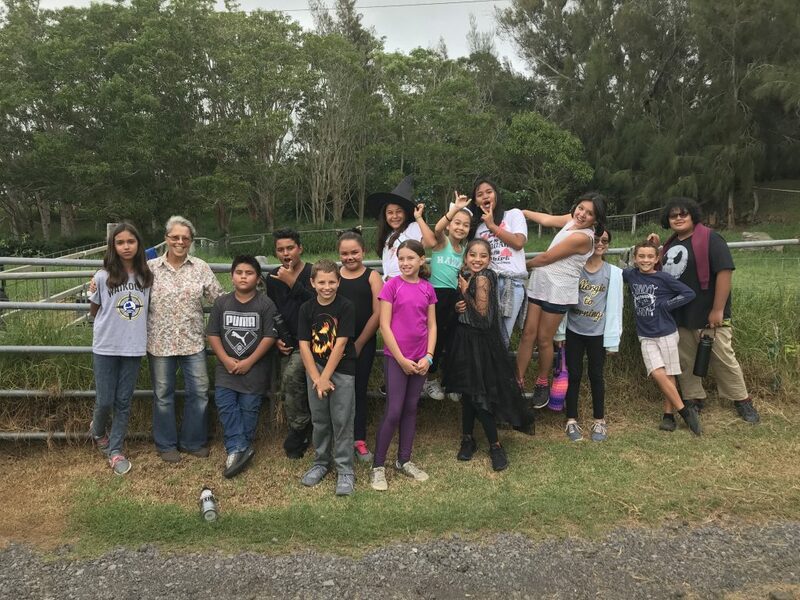 This gave us the opportunity to attempt revegetation with native plants through seed broadcasting by controlling the regrowth with herbicide and creating a window for native plants to regenerate before being the area is reinvaded by invasive grasses. The first step was to control the invasive grass regrowth before the plants were able to flower and produce seeds. Subsequent rainfall caused the grass to grow back quickly so we had to rely on partners to help get the 22 acres controlled as quickly as possible. We then invited our volunteers to come out and help us collect over one million seeds from within the forest preserve. We also looked to our conservation partners and seed banks to help us amass additional native seeds to broadcast in the burned area. Once collected, we cleaned, sorted, weighed and divided seeds from nine different species selected for their ability to colonize barren areas. 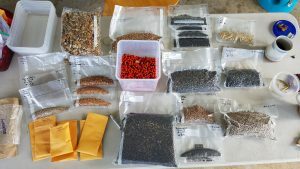 We divided the seeds into 44 packages to be scattered systematically in half-acre plots throughout the burned area. Again, we called upon our partners and volunteers to help us do this work. In the end, we scattered millions of seeds throughout the 21.5-acre area and in a half-acre trial plot outside of the fence that will test our methods in the presence of feral goats. Now, we wait. Over the next years, we will be tracking the progress of this effort by sampling vegetation plots throughout the area. 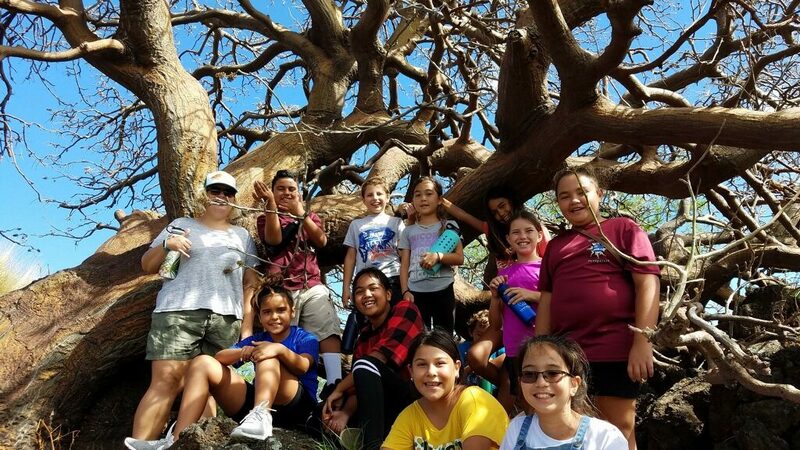 What we hope to see is the slow recolonization by native ‘aʻaliʻi, ʻilima, ʻāweoweo and other natives that haven’t been seen in this area for decades. Already, we are seeing the native pili grass, ‘uhaloa and others are starting to regenerate. 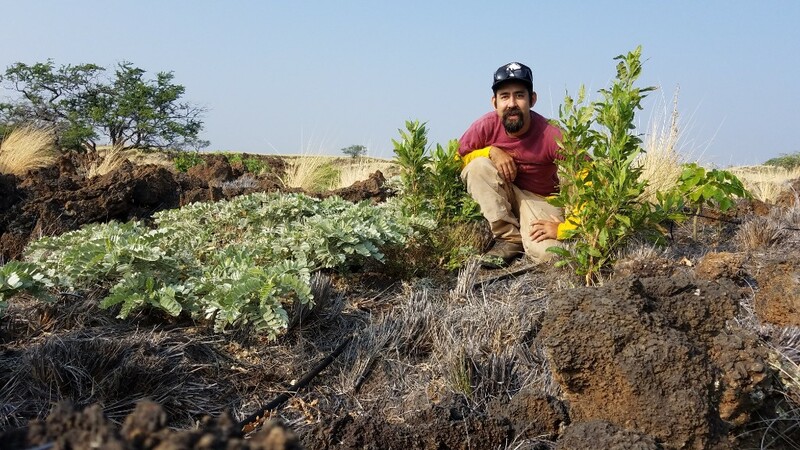 We are hopeful that this method will be effective and that we can start to refine a post-fire action plan for revegetating with native plants that can be used by other land managers in the fire-prone areas of our islands.